I am republishing an old article posted earlier in December 2008. This has been one of the most visited and read article on Indian Stocks News. This article has been read more than 13000 times since Dec. 08. I thought it's good time to re-visit the past and learn something from it. I would like to invite you to conclude the learning. Put it as comments below the article. FMCG Stocks are now catching eye of investors for investing as best option in stock market. Analysts and market experts are now putting a ‘buy stock’ recommendation on select FMCG stocks. FMCG stocks seem to be the dark horse on the bourses. These stocks are now catching the eye of investors. Analysts and market experts are now putting a ‘buy’ recommendations on select FMCG stocks, a move which is not just being considered as a safe ploy but also as a defensive strategy to counter a volatile and uncertain market. The trend is visible on the bourses where leading FMCG counters have outperformed the overall market during the last few sessions. Take the case of MNC giant Hindustan Unilever (HUL). The company’s stock has made its 52-week high at Rs 267 on December 19, at a time when BSE’s benchmark index, Sensex, was trading under the 10,000-mark (down by over 50 % from its life-time high of 21,000 made in January, 2008). Similarly, the scrip of another FMCG giant, Godrej Consumer, is currently hovering near its 52-week high of Rs 145. On Wednesday, the stock price closed at Rs 138. Other companies like P&G , Dabur(I) and Colgate Palmolive have also recorded better performance on the bourses. 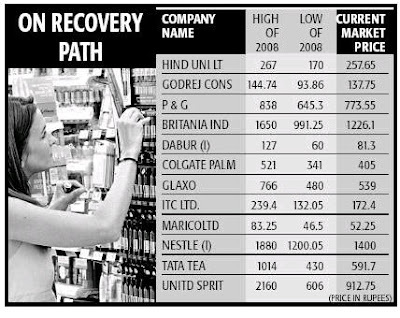 Market analysts who earlier stayed away from FMCG stocks are now taking a fresh look at these rising scrips. Though some reservations about the FMCG sector still persists, the analysts have accepted the “safe” nature of these stocks. “Fall in commodity prices (from crude, vegetable fat and food articles) is the main reason behind the outperforming FMCG sector. Earlier trends indicate that fall in commodity prices will lead to an improvement in profitability of the FMCG companies in the next fiscal. Such a phenomenon will not remain limited to just soaps and detergent companies; even paints, confectionery, food processing and others will get benefit of the fall in commodity prices,” said Ajay Parmar, head, equity, Emkay Global Financial Services. “Those who want to play defensive can invest in such stocks,” he added. Anand Shah, a research analyst at Angel Broking, is also optimistic about the FMCG sector. Though the markets (at current level) have already discounted the positive impact of the fall in the raw material costs, Shah believes that those who wish to play safe should invest when the prices of the FMCG scrips fall. “FMCG companies will be able gain cost advantage on raw materials, freight, transport and packaging. The balance sheet of the FMCG companies will definitely gain strength in the coming quarters,” Shah said while cautioning the investors to adopt a stock-specific approach instead of a sector-specific one. However, not all are convinced. “Now-a-days , smaller players are eating into the business of big MNC players in the FMCG sector. Biggies are therefore losing their market share,” says VVLN Sastry, country head at Firstcall India Equity Advisors. “There is some momentary activity in FMCG stocks, which is a part of the defensive strategy adopted by the traders to restrict the downslide. But this trend will not prevail for a long time,” he added.